With Audi’s quattro permanent four wheel drive system dating back to 1980, it’s surprising the company waited so long to introduce their first SUV. 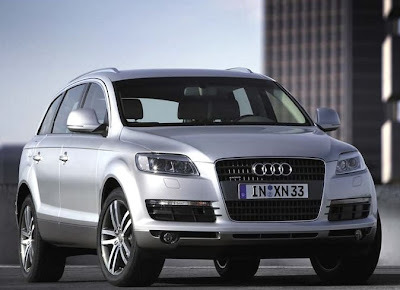 Either way, here it is: Audi’s superb Q7. Originally launched with three engine configurations: a V6 and V8 petrol and a 3.0 turbo diesel, the range now includes the world’s most powerful diesel passenger, the truly awesome 375kW V12 TDI. With the diesel engine patented by a German over 100 years ago, it has taken a long time to reach this level of sophistication and now, especially with critical eyes looking at the fuel consumption of large SUVs, diesel power is a popular and sensible option. Claimed economy of the V8 is 13.6l/100km. Out test vehicle was the powerful 257kW 7-seat variant and we spent much of our touring with six people aboard. In most seven seat models, the two rearmost seats are usually only suitable for children or undersize adults and in this respect the configuration was perfect. The two collapsible seats were still beautifully upholstered in leather and very comfortable. Across the range, up to 28 seating configurations are possible. Although we didn’t test the extreme end of its 4WD ability, I’m assured the Q7 is up for a Simpson Desert crossing anytime you feel the urge. The V8 model features adaptive air suspension as standard that allows the driver to vary the ride height of the vehicle according to the terrain. Bitumen touring is how you’d expect: smooth, quiet and effortless. The mighty V8 is almost silent at normal running speeds and still barely growls when urged. With full load, the acceleration is understandably subdued, but for a bit more excitement, flick over the tiptronic transmission to manual and drive through the six gears to your heart’s content. Many of the truly high-end enhancements like sun roof, and radar-controlled vehicle distance monitoring are optional, but essentials like air conditioning, ABS, stability control and eight airbags are standard as is Audi’s signature build-quality and fully galvanized bodywork. * The combined automotive authorities (NRMA, RACV etc) rated these vehicles recently in their famously impartial, annual Australia’s Best Cars (ABC) report.